“Members of the SARF and the FORSOAR and some lay groups in our parishes are also helping us not only in scouting for vocations but also in morally and financially supporting our seminarians,” he continued. The Secular Augustinian Recollect Fraternity (SARF) in the Philippines as well as the Former Seminarians of the OAR (FORSOAR) – Cebu Chapter have explicitly integrated in their Life and Mission Project and program of activities, respectively, their own way of backing up the Province’s vocation ministry. To promote this culture is a shared mission with all the members of the Recoletos Family and the lay collaborators in all areas of apostolate. The need for an active team of vocation animators, meetings for strategizing action plans and follow-ups, inclusion of children and young people in the activities, and the integration of the OAR charism and spirituality in these vocation-related programs are geared towards a fruitful vocation expedition. Among the strategies to be employed include convocation (using “marketing” principles and media outlets), logistics, and customized/contextualized activities (holy mass, inputs, holy hour, praying of the vocation rosary, sharings, etc.). Few weeks after his arrival from Panama, Fray Jacinto received his patente (an official document of assignment) as member of the Recoletos de Provincialate community. He was also appointed as the Head of the Section for Vocation Ministry and as the National Vocation Director of the Province. As demanded of him as the NVD, he had to sit down with the previous in-charge and, then, make his own approach based on the practices of the Province and those of CBCP (Catholic Bishop’s Conference of the Philippines) as well as the new guidelines from the Generalate in Rome. Towards the end of September, he set out on a “fishing” expedition, prepared to immerse in a new kind of “trekking” far different from the one he experienced when he was working as a missionary in Bocas del Toro, Panama. After his first stop at Colegio de Sta. Rosa in Intramuros, Manila, which is run by the Augustinian Recollect Sisters, he headed northwest, in Pangasinan, where he visited three secondary schools: St. Charles Academy in San Carlos City, and Urbiztondo Catholic School and Urbiztondo National High School in the municipality of Urbiztondo where the Recoletos de Pangasinan community is located. In early October, he went to the Holy Name Academy in Palanas, Masbate which is also administered by the AR Sisters. Then, he hopped to Cavite where he repeated his vocation campaign program: at the San Sebastian College-Recoletos, Cañacao Campus and the St. Joseph College. A recess to his series of campaigns came when he participated in the National Assembly of NVDs on November 16, 2018 in Bacolod City. Organized by the CBCP, the assembly was meant to update the vocation directors of some salient issues to consider i.e., the psychology of the millennials and some suggested ways to handle and evaluate candidates coming from this category. 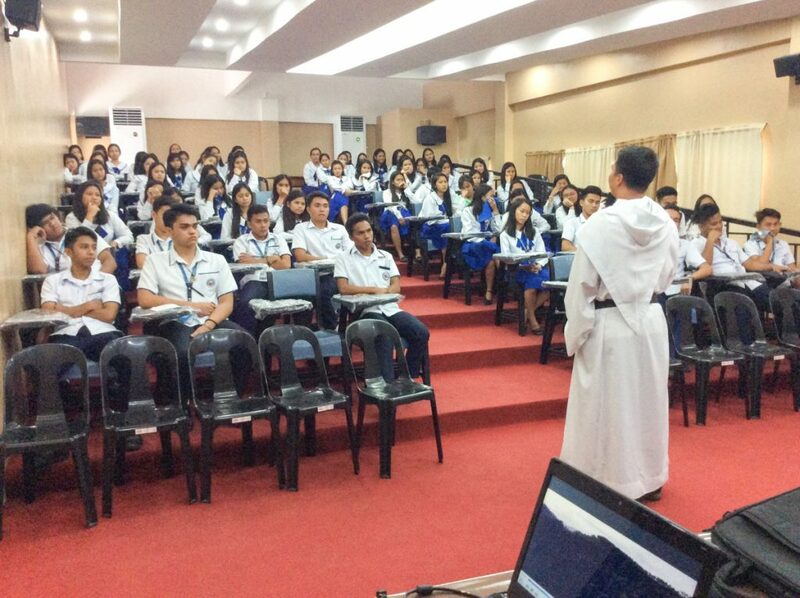 While in Bacolod, he grabbed the opportunity to gather the Grade 10 and the Senior High School (namely, Grades 11 and 12) students of the University of Negros Occidental-Recoletos. And he had observed that the Grade 10 students, who were still contemplating on the remaining two years to finish their Basic Education, were rather undecided whether to enter the seminary or not. 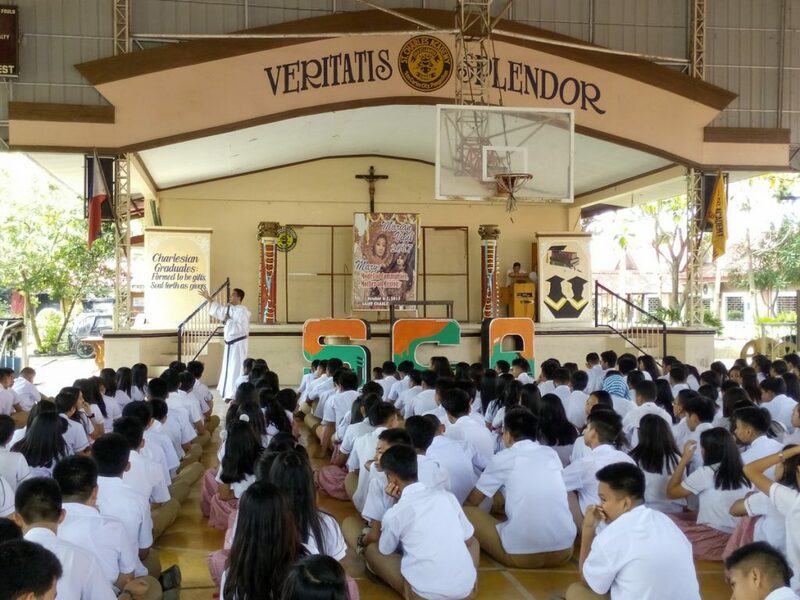 The last week of November saw him talking to the young people of Valencia, Negros Oriental, particularly at San Pedro Academy (SPA) and San Pedro Academy-Recoletos (SPA-R). In mid-December, he was at the Lady Mediatrix School of the AR Sisters in Candelaria, Quezon. 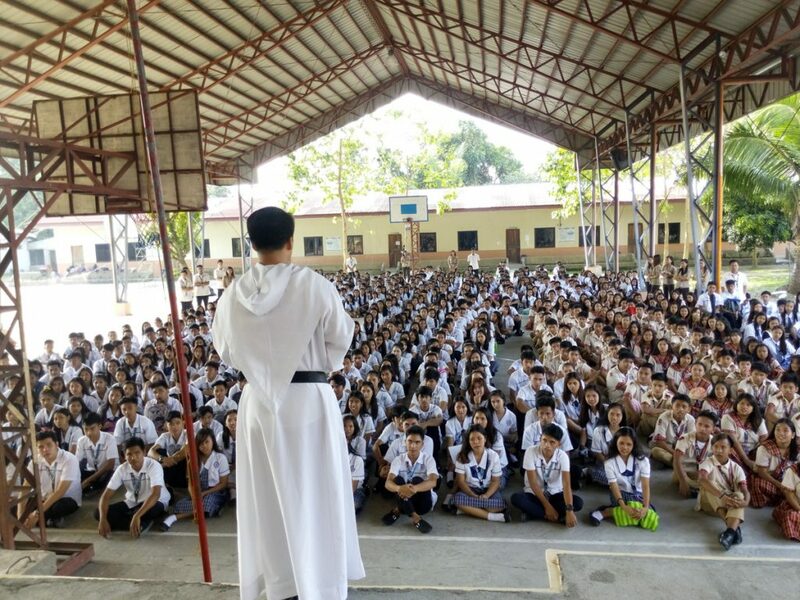 In early January 2019, he crossed to Cebu where he met the students of Sta. Monica Academy (Pinamungahan), Consolatrix Academy (Toledo City), Immaculate Heart of Mary Academy (Minglanilla) – all run by the AR Sisters – and those of the University of San Jose-Recoletos, Balamban Campus. He also made a side trip at the nearby St. Therese Catholic School in Balamban. Then, he jumped to Bohol and covered all the schools of the AR Sisters: Colegio de la Medalla Milagrosa in Jagna, Saint Mary Academy in Guindulman, and Blessed Trinity College in Talibon. With the AR Sisters collaborating, the program of activities for Vocation Expedition in all their schools went smooth. And they do the follow-up even after the program has ended! As of December 2018, a total of 57 applicants expressed their desire to enter the Recoletos seminary and underwent the preliminary tests and interview. But the results narrowed the number to only 25. Of these, 10 were classified as college students and 10 for Senior High. With the Expedition still going on, Fray Jacinto hopes with optimism that more prospective candidates will still knock at our doors. “That’s why we pray to the Lord of the harvest,” he says.